Free Info — Westerburg & Thornton, P.C. Our commitment to you is to offer the highest quality legal services and information. 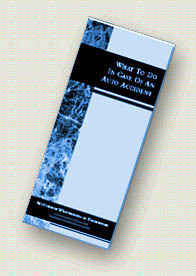 Let us send you a brochure, free of charge, "What to Do in Case of an Auto Accident." This brochure is available in the PDF format which can be downloaded, viewed, and printed. We also provide a PDF version of our web site content in a brochure format. We hope this will prove a convenient reference.